The first car at our MediaCityUK charging bays. Peel Energy is delighted to announce the installation of 10 GeniePoint Network connected chargers at MediaCityUK in Manchester. The installation is the first phase of the project between Peel Energy and ChargePoint Services, to connect Peel Land and Property’s developments to the nationwide GeniePoint Network. As a creative and digital hub, MediaCityUK, situated on the banks of the Manchester Ship Canal, is home to the BBC, ITV, Kellogg’s, Ericsson and the University of Salford, as well as over 250 smaller businesses. Around 7,500 people now live and work within MediaCityUK and the installation of GeniePoint Network electric vehicle chargers will hugely increase the capacity to accommodate electric vehicle drivers visiting or based in the destination. 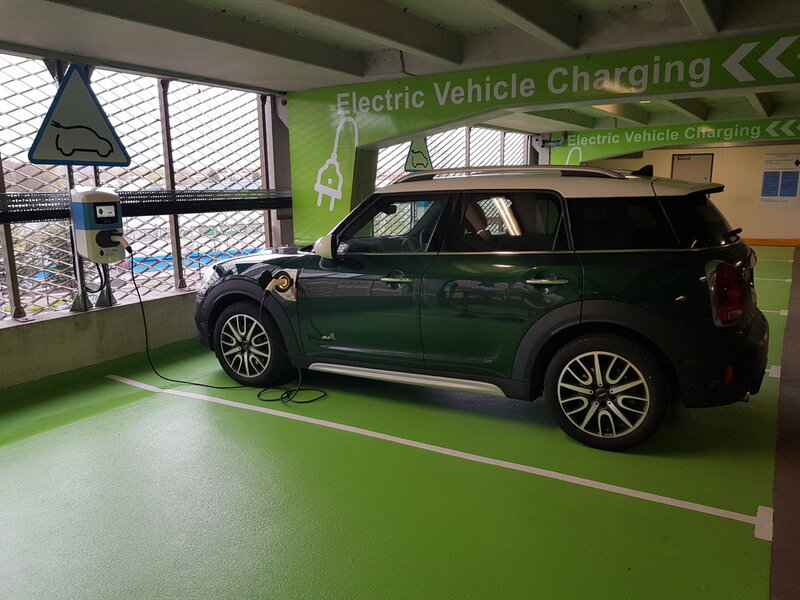 With over 10,000 car parking spaces across the Peel portfolio, demand for electric vehicle charging will continue to grow across many of its developments in the UK. Drivers can simply use an RFID card or the GeniePoint Network mobile web app, to securely access the 10 22kW fast chargers which are situated on the second floor of the multi storey car park within the site. Supported by ChargePoint Services’ 24/7 customer service centre, the chargers will provide an essential service at MediaCityUK. The students, Muir and Michael on site. “We had a fantastic talk by Managing Director Muir Miller and Operations Manager Michael Humphreys about the planning process the project had to undertake before approval, the engineering and construction challenges, and how this was achieved in an environmentally sensitive area that required careful management of the local habitat and wildlife”. Muir and Michael gave the students a tour of the site, which included a visit to the wind farm control centre and several of the turbines. The pair were met with many interesting questions about the day-to-day running of the wind farm, as well as more technical questions about the engineering design and construction of the turbines themselves. David Sprake noted that “trips like this one help bring to life the theory we teach in the classroom.” It is clear that these students represent the future of the Renewable and Sustainable Engineering, and Peel Energy are pleased to be involved in supporting their education and development. The Peel Energy Biodiversity Policy can be downloaded here.